Dongyun brand design was established in 2005. Our aim is to design unique and excellent brand for customers. 13 years of design process, from brand strategy positioning, brand image, brand promotion, investment operation, to establish a unique business design operation mode. To deal with market changes skillfully, use its unique design concept to enhance the brand value for the market. Customers are all over China, France, Germany and other countries, including international brands: France SEB, Germany franken, and domestic famous brands: supor, Yintai group, wahaha, etc. Design [ruan shi pearl], [18 imperial tea], [kang mei lai] three national gift brands. Company specializing in the field of outstanding achievements, the awards won over 60 of the world's top awards, including the D&AD yellow pencil award, 97 session of ADC cubic silver award in New York, the world packaging world Oscar gold prize, bronze PENTAWARDS, world design Academy Awards: red dot award in Germany, the German national award silver medal, TDC font club award in Tokyo, Japan, etc. Dongyun brand design director, famous designer. A new generation of brand packaging designers in mainland China, with the traditional Chinese art and humor. 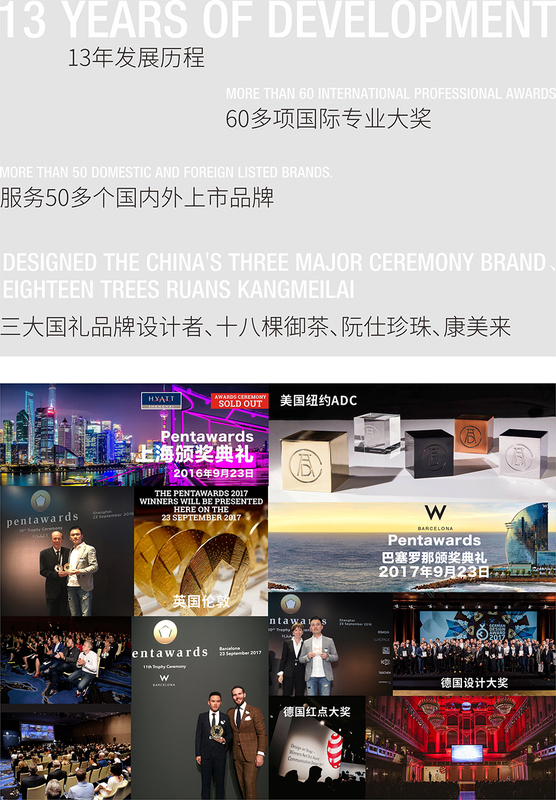 China's first New York ADC packaging silver cube award winner. China's first gold award winner of the British PENTAWARDS food nut. Chinese college students design competition final judges. 2018 \ UK D&AD yellow pencil award. 2017 \ UK [PENTAWARDS] 2017 gold award. 2017 \ Germany red dot grand prize 2 awards. 2017 \ GDC graphic design in China 6 merit awards. 2016 \ bronze awards in the UK. 2015 \ TDC Japan Tokyo typeface club award winning prize. 2015 \ Australia was selected as an international famous publishing group. 2012 \ TDC Japan Tokyo fonts club award winners.